Now finding math resources for educators is easier than ever before! INFOhio has always had resources that support math instruction, but it could be difficult to find that content in the past. With the enhancements made to INFOhio's website and the transformation of INFOhio’s Educator Tools, that problem has been solved! 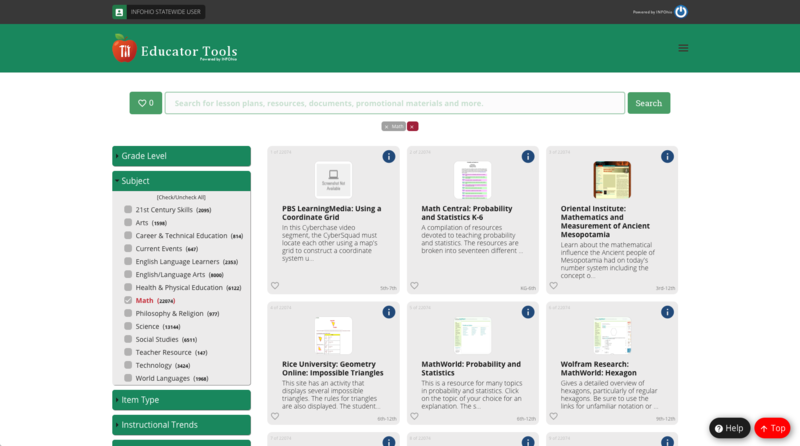 Educator Tools, powered by INFOhio, now includes more than 50,000 teacher-approved lessons, assessments, and other instructional materials. In INFOhio’s Educators Tools, you’ll find the best-in-class learning resources for all grades and all subject areas, including (and especially) math! In Educator tools, click the Subject category on the left, check the box next to Math, and you’ll get thousands of high-quality results! You can narrow your results to those that meet the standards for your grade level by adding grade level limiters. You can use any of the resources you find in your results for FREE in your classroom. Educator Tools is only the half of it! For more information on INFOhio’s math resources, visit the Learn With INFOhio blog, INFOhio is Mad about Math. Questions about math resources? Please visit support.infohio.org. Calling all grade 4 and 5 educators in Ohio! How would you like to expand your classroom library by more than 350 eBooks in a matter of minutes? Storia: Ohio's 4th & 5th Grade eBook Collection now includes more than 350 eBooks selected especially for Ohio's 4th and 5th grade students – FREE through INFOhio. The collection of eBooks includes features designed to help your students build the reading skills they need for a successful future. As a valuable literacy tool that can be used in teaching and for developing student independent online reading skills, Storia will help students read, comprehend, and analyze digital text, creating learners who are digital and media literate. Ready to get started with Storia? Watch this webinar recording to get a complete walk-through of the Storia program, including FAQs for how to set up an account and get students started. Plus, as the webinar navigates you through the resource, you will learn first-hand how to apply digital reading best practices in your classroom with teacher-driven tips on instruction to personalize learning for your students. Although this webinar has passed, you can still watch the recording and complete a short quiz to earn a contact hour certificate. 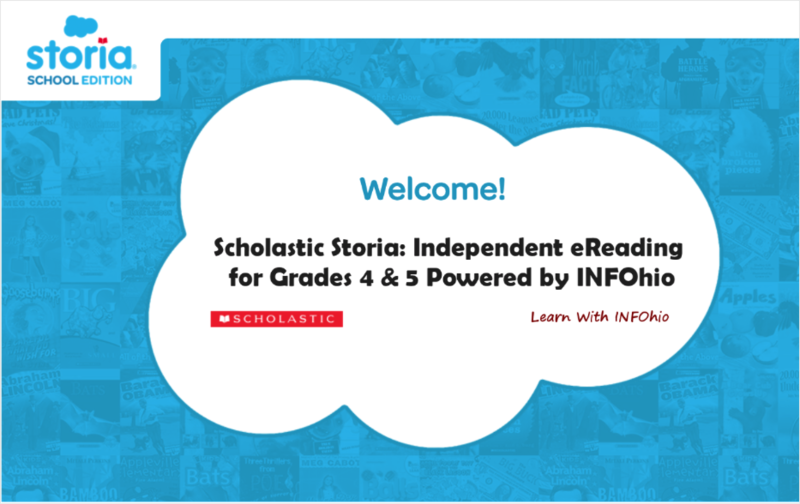 Do you have questions about Storia: Ohio’s 4th & 5th Grade eBook Collection from INFOhio? Send them to INFOhio at support.infohio.org. Expand the world as students know it with new enhancements to World Book Student from INFOhio. World Book Student is an online encyclopedia that includes eBooks, videos, activities, read-aloud, and translation features. Students can explore over 150 new articles in World Book Student, and they can also now browse all articles by Subject feature. 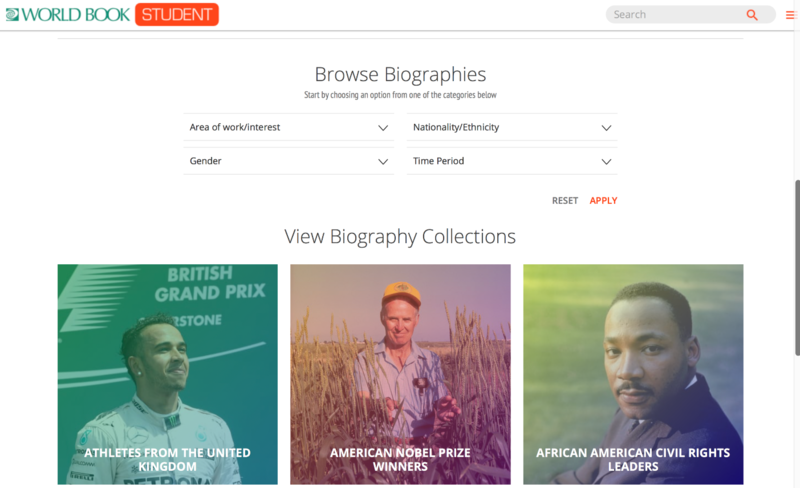 The Biography Center within World Book Student has not only undergone a complete redesign, but 100 new biographies have also been added. Students can now easily search or even browse by area of work, nationality, gender, or time period. The biographical articles students find in World Book Student are trustworthy and authoritative. Every biographical article includes a citation helper that gives students a rough draft of the citation in several different formats, making it easy for students to use the information they find while avoiding plagiarism. 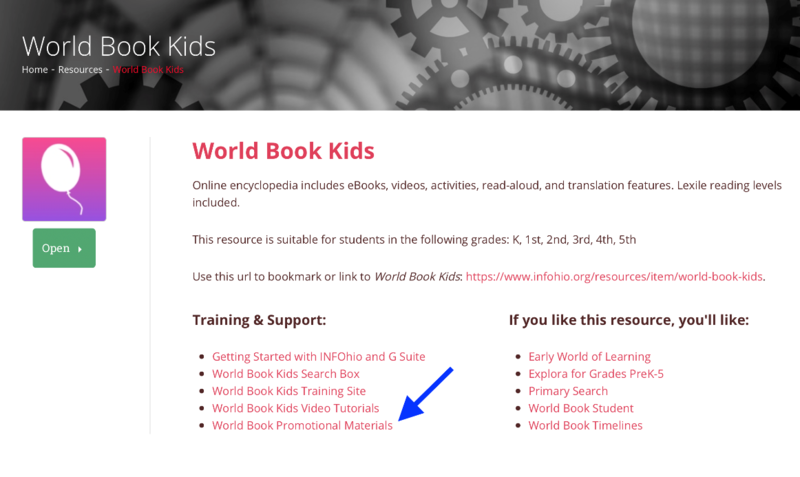 If you’re looking for a way to promote World Book resources from INFOhio in your school, library, or classroom, check out the new World Book posters. You can find all of the World Book promotional materials by clinking the World Book Promotional Materials link on the More Info (or i-button) page for any World Book resource. For more information on World Book, please contact INFOhio at support.infohio.org.